1.1.1.1 Maximum thrust in N.
Special designs are available when seismic conditions are speci ed, to increase stiffness and natural frequency. Standard materials are WCB cast steel yoke, stamped steel for cover and base plates, reinforced Buna, Neoprene, EPDM, etc., diaphragm. All parts are protected against rust and corrosion. Any type of accessories such as positioners, converters, air-sets, solenoid valves, limit switches and others as well hand wheel are tted as necessary. We use positioners and accessories from all mayor manufacturers providing the latest technology for smart instrumentation with diagnostic capabilities as well as partial stroke testing. RlNGO VALVULAS manufactures a comprehensive range of double-acting and spring-return piston pneumatic actuators which suit all valve sizes. The sizing of these units is speci cally calculated for each application. 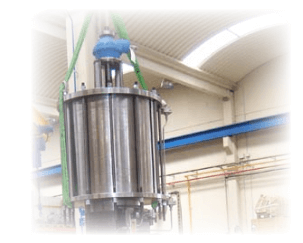 • Carbon steel design single and double acting cylinders, electroless nickel-plated to reduce the surface roughness and to provide minimum friction and maximum protecting against corrosion. • PTFE / rubber seals are added to nickel plated carbon steel piston to reduce friction and avoid stick slip effect even after prolonged periods without operation. • Carbon steel chromium plated piston rodis included in order to prevent corrosion and to minimize sliding friction on the dynamic seals. • Visual position indicator directly connected to the valve stem showing actuator/ valve full linear stroke. 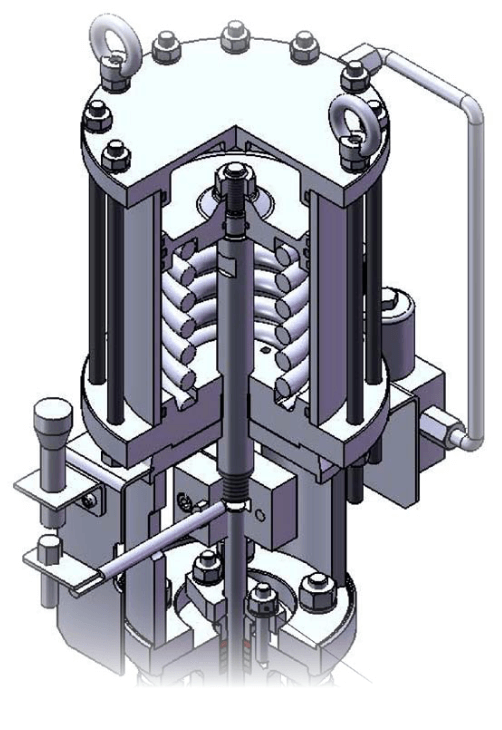 • Totally enclosed carbon steel spring cartridge with additional safety feature to avoid injury during the disassembly of the spring enclosure. • Adaptor in open type made in carbon steel with bottom ange machined according to the valve ange. • Actuators can be fitted with handweel on request. 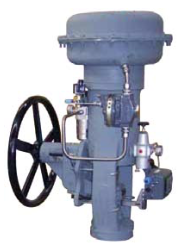 Many valve/ actuators applications request a dependable manual override facility. Ringo Valvulas offers a wide variety of options to meet clients’ requirements. 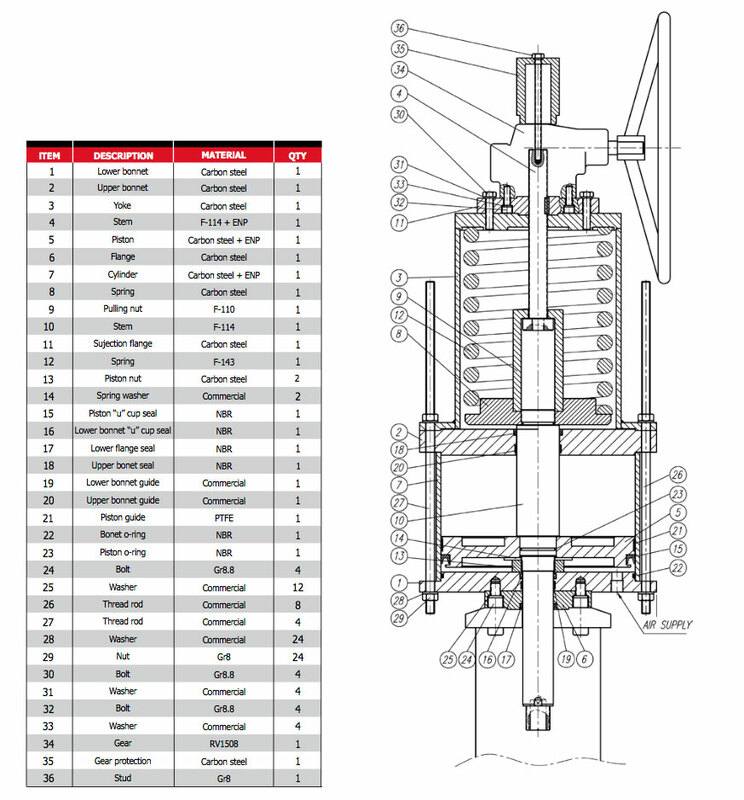 These options include handwheel jackscrew, hydraulic hand pump and gearbox solutions.